Prior to the creation of what all Washingtonians simply refer to as Arlington, various military cemeteries were created. Collectively they are considered national cemeteries both in the US and abroad. One of the oldest is the Alexandria National Cemetery, established in 1862 as the Soldiers’ Cemetery, and located six blocks west of U.S. Highway 1 in the city of Alexandria. 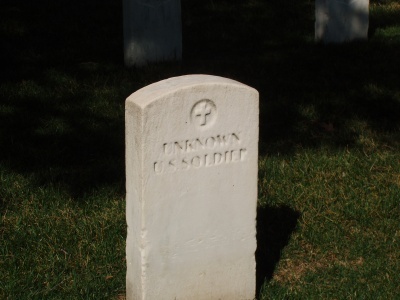 The need for military burial ground was especially great with the massive death toll of the Civil War, especially in Virginia where sixty percent of all Civil War battles took place. 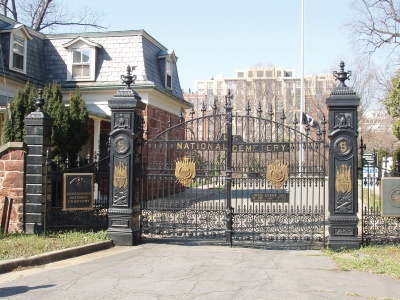 The main entrance to the Alexandria National Cemetery is on Wilkes Street. It is the last in a series of aged cemeteries along this lane with graves dating back to the 18th century. An impressive twelve foot wide ornamental wrought and cast iron gate marks the entryway. Defining this relatively small property as a place of importance is a substantial red sandstone wall. It anchors this undulating ground as if to declare, “This ground, in perpetuity, is where heroes lie.” The graves are marked with simple & dignified white marble headstones laid out like a regiment of soldiers with every two rows facing one another. Remembered for all time are 4,230 men who served in the Union Army of the Potomac. The City of Alexandria was the site of one of the principal camps for northern Virginia troops sent to defend Washington at the outbreak of hostilities between the North and South. Here, in response to the popular slogan, “On to Richmond,” the Union Army of the Potomac was assembled from a miscellaneous collection of militia regiments. The force was approximately 2,000 strong and 722 of these men, thirty-six percent of the total force, both African American and Caucasian were native Alexandrians in local units. Located within the city of Alexandria were a number of hospitals and convalescent centers for Federal troops wounded in the field. 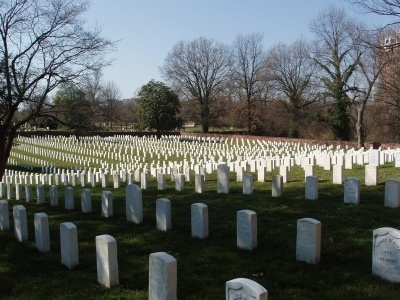 The Alexandria National Cemetery served as the burial ground for soldiers who died there and in the surrounding area. Two famous hospitals were at Camp Hall, a private residence seized by Union Troops and converted to a hospital at 806 Prince Street and Greens Mansion House Hotel (directly in front of the Carlyle House) along with the property that surrounded it at 121 North Fairfax Street. Known as the Manson House General Hospital, it was a 700 bed facility where Walt Whitman once visited. The original superintendent’s lodge at the cemetery was constructed in 1862 and destroyed by fire in 1878. Nine years later, a brick Italianate utility building was extended from the original lodge which added a kitchen, store-room, and tool room. Landscaped by ancient yews and substantial boxwood shrubbery, this L-shaped lodge is of the Second Empire style and adds a warm and interesting welcome to the entrance. The first floor has an impressive ten foot ceiling height while three bedrooms can be found on the second floor, one of which has a corner partition for a hall bathroom. In 1880, the City of Alexandria designated a tree estimated to be 200 years old, as an Alexandria Centennial Tree. It is a Liquidambar styracifua species and graciously shades the central portion of the cemetery. Much later, in 1946, a fieldstone and slate assembly area with flagpole was added where ceremonies for these veterans could be conducted. This assembly area is surrounded by low fieldstone walls with stone steps leading down from the flag to the plaza, facing away from the entrance gates and lodge. Although aligned with the main gate, by simply lowering the plaza, the tombstones are respectively allowed to remain the dominant feature. A final feature at this solemn yet beautiful place is a special monument, erected on July 7, 1922 by the United States Government in memory of the men who died while in pursuit of John Wilkes Booth.The monument is a bronze tablet on agranite boulder base in the center of the ceremonial flag plaza. The four members of the Quartermaster Corps honored by this monument drowned in the Rappahannock River on April 24, 1865, while in pursuit of Abraham Lincoln’s assassin. They are buried in Section A, Graves 3174 – 3177. By 1864 this hollowed ground was almost filled to capacity which led to the development of the Arlington National Cemetery, the subject of next quarter’s edition of ENDEAVOR. Listed in the National Register of Historic Places, Alexandria National Cemetery is administered by the Veterans Administration.